TORONTO--(Marketwire - Feb 26, 2013) - On March 8, countries and cultures around the world recognize women's accomplishments, opportunities and challenges with International Women's Day. Celebrated for over 100 years, the holiday is marked with activities and events that herald women and, often, focus on ways to continue reaching new goals. In honour of this special day, the travel experts at Cheapflights.ca, the online leader in finding and publishing travel deals, pay homage to women trailblazers and their contributions throughout history with a list of Top 10 Monuments to Women Leaders. These memorials and the tales of greatness behind them are tangible history lessons about leaders and leadership across times and cultures. Below are four monuments to make our list that honour women leaders from Commonwealth countries across the globe. Victoria Memorial, London, England - A fitting tribute to the longest reigning British monarch (Queen Elizabeth II has more than two years to go to catch her), this bronze and marble memorial stands grandly in front of Buckingham Palace in the centre of the Queen's Gardens. Dedicated in 1911 and finished in 1924, the Victoria Memorial features layers upon layers of detail. Most notable is the gilt-coated, winged Victory figure that towers down from on high. The statue of Queen Victoria, a 13-foot likeness carved in stone, faces away from the Palace and down the Mall. She is joined by an angel of Truth on one side and Justice on the other with Charity (or Motherhood), a figure with three children, rounding out the circle at the centre of the memorial. Flowing out from there are fountains, a series of nautical details and groupings of bronze statues. This expansive display of honour for a beloved and historic Queen was, appropriately, the setting for the 2012 concert marking Queen Elizabeth's Diamond Jubilee, a celebration of her 60th year on the throne. Edith Dircksey Cowan Memorial, King's Park, Perth, Australia - An established champion of women's and children's issues, Edith Cowan campaigned hard in the effort to pass the 1920 legislation to open Parliament to women. When the legislation passed, she immediately put it to the test, running in the 1921 State Election to represent West Perth in the Legislative Assembly of Western Australia. Well known through her work for the Red Cross during World War I and her involvement with groups ranging from the National Council of Women and Children's Protection Society, she won her seat and became the first female in any of Australia's Parliaments. While in office, she continued her trailblazing ways, helping enact legislation that opened the legal profession to women. Her role in history is marked by an elegant clock tower, roughly 20 feet tall, at the entrance to King's Park. Built in 1934, the memorial itself is a trailblazer too as it is believed to be the first civic monument built to honour a woman in Australia. Kate Sheppard Memorial, Christchurch, New Zealand - When counting New Zealand's many claims to fame, make sure to include it was the first country to introduce universal suffrage, granting women the right to vote. The 1893 petition for the right to vote had more than 31,000 signatures. The group spearheading the seven-year process of championing the cause and gathering those names was led by Kate Sheppard. A 10-foot tall bronze sculpture shows Sheppard and fellow suffragette leaders Helen Nicol, Ada Wells, Harriet Morison, Meri Te Tai Mangakahia and Amey Daldy bringing the petition to Parliament in a cart. Unveiled on 1993, this monument along the Avon River, holds a time capsule of documents capturing women's lives in 1993. The success of the right-to-vote movement in New Zealand made Sheppard and the other leaders role models for voting activists in countries around the world. Sheppard even returned to her native England in 1894 where she spent almost two years working with suffrage leaders and encouraging supporters with her speeches. In the early 1900s, she travelled again to England, the U.S. and Canada, meeting with women leaders as she went. Rounding out this impressive list of memorials in honour of women across the globe are: Julia Tuttle Statue, Bayfront Park, Miami, Florida; Fremiet's Joan of Arc, Place des Pyramides, Paris, France; The "Swing Low" Harriet Tubman Statue, New York, New York; The Portrait Monument, United States Capitol, Washington, D.C.; Monument to Catherine the Great, St. Petersburg, Russia and Estatua de Policarpa Salavarrieta, Bogotá, Colombia. To read Cheapflights.ca's complete list of Top 10 Monuments to Women Leaders, visit www.cheapflights.ca/travel/top-10-monuments-to-women-leaders. momondo Group is an online travel media and technology company that is driven by the belief that an open world is a better world. The group now serves travel search and inspiration to over 13 million visitors a month -- plus 6 million travel newsletter subscribers -- via its Cheapflights (www.cheapflights.ca) and momondo (www.momondo.com) brands. 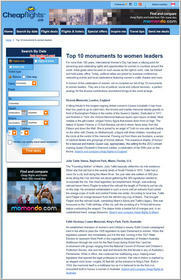 Screenshot of Cheapflights.ca's Top 10 Monuments to Women Leaders in honour of International Women's Day on March 8. These memorials and the tales of greatness behind them are tangible history lessons about leadership through time and honour the diverse contributions womankind brings to the world.